Goodwill's philosophy is "not charity, but a chance." We offer opportunities for individuals with disabilities, disadvantages and other barriers to employment including criminal backgrounds to reach their full potential and become productive members of the workforce. Goodwill can provide skill training, guidance and real-world experience to job seekers. Goodwill works hard to match job seekers with employers. Before individuals are referred to our workshops they are carefully screened and counseled. This screening process assures potential employers that they will have the opportunity to interview and hire a highly qualified and motivated workforce. 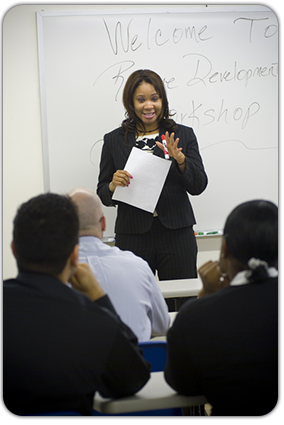 Our job preparation workshops offers job seekers individualized instruction based on their abilities and experience. Programs cover oral and written communication skills, resume preparation and interviewing techniques, as well as basic computer skills and managing finances. We offer job seekers in-depth classroom training along with hands-on experience in a variety of career options. For more information contact us at (773) 627-5777 to learn more.